Have you ever asked yourself the question why do solar flares explode? An interesting unmanned space mission aims to gather more data to answer this question. 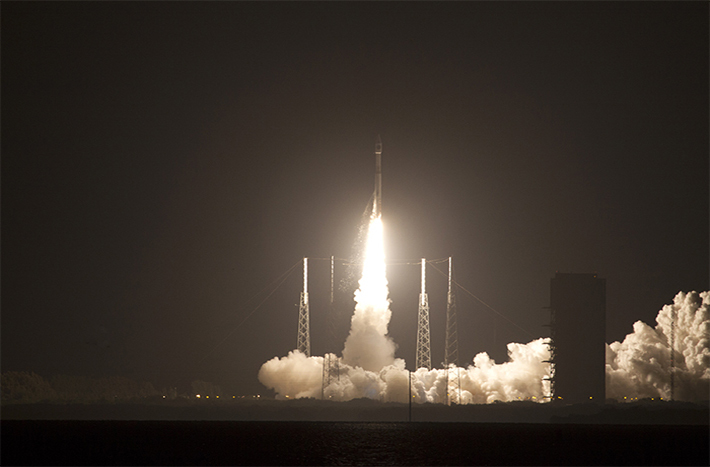 On March 12, four identical Magnetosperic Multiscale – MMS observatories were launched from Cape Canaveral, Florida aboard an Atlas V rocket. Goddard Space Flight Center is overseeing this new science mission to learn more about a phenomena known as magnetic reconnection which affects space weather. American Meteorological Society defines space weather as variable conditions on the Sun and in the space environment that can influence the performance and reliability of space-based and ground-based technological systems, as well as endanger life or health. MMS observatories are four identically instrumented spacecraft equipped to measure particle and plasma fields. These spacecraft will gather data from a near-equatorial orbit where reconnection is common. To achieve this objective the mission will investigate the Sun’s and Earth’s magnetic fields connection and disconnection. Interaction of these fields creates an explosive energy transfer from one celestial body to the other. Magnetic reconnection is the formal scientific name given to this occurrence. Magnetic Reconnection is an important process for the Sun and other planets throughout the universe. It affects many different such as geospace weather and the performance of fusion reactors. Geospace weather affects various modern technological systems like GPS navigation, electrical power grids and telecommunications networks . Gaining a better understanding of space weather helps with creating forecasts in the future as well as developing better instrumentation. MMS will also help in developing further scientific studies on space weather. The MMS observatories will orbit Earth for the next two years. However the scientific discoveries from this mission will last far longer than that.